This correction takes into account the path delay in the radar return signal due to electron content in the atmosphere. 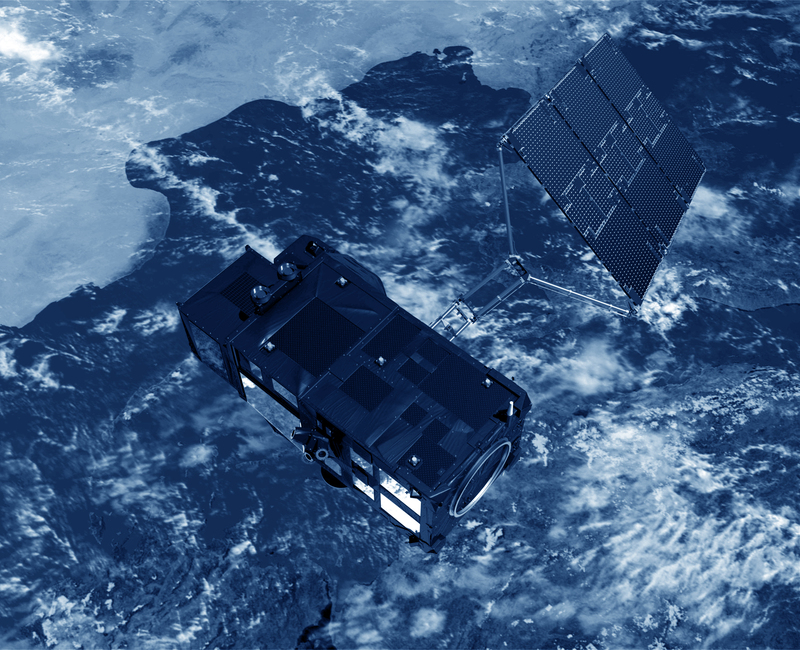 Calculated by combining radar altimeter measurements acquired at two separate frequencies (C-band and Ku-band for Topex and Jason-1, Ku-band and S-band for Envisat) or from DORIS measurements (Topex/Poseidon, Jason-1 and Envisat). Its order of magnitude can reach 0 to 50 cm. The ionosphere is the uppermost layer of the atmosphere (ranging between about 60 and 800 km), distinct from the other layers by the fact it is ionized. The electrons that interfere with the radar wave propagation have their highest concentration between about 250 and 400 km. Ionization of this region of the atmosphere is attributed mostly to extreme-ultraviolet radiation from the Sun. Seasonal variations, as well as 11-year variations (corresponding to the solar cycle), can be seen. Number of sunspots, episodic X rays and solar particle fluxes associated with solar flares can also occur. Significant disturbances are also measured in particular during geomagnetic storms caused by the interaction between the solar wind and the Earth’s magnetic field (The solar wind consists of a constant stream of charged particles flowing outward from the Sun. Most of these particles are deflected by the Earth’s magnetic field. But some get through to the ionosphere and interact with the atmosphere). fig 1. Amplitudes in metres of the ionospheric correction derived from Doris measurements. This map is drawn using the BRAT from the Jason-1 GDR products. A Loess filter (value of 31) is applied to obtain a fully coloured plot. The propagation velocity of a radio pulse is slowed by an amount proportional to the density of free electrons of the Earth’s ionosphere, also known as the total electron content (TEC, measured by the total electron content units, 1 TECU = 1016 el. m-2). The retardation of velocity is inversely proportional to frequency squared. For instance, it causes the altimeter to slightly over-estimate the range to the sea surface by typically 0.2 to 20 cm at 13.6 GHz. The amount varies from day to night (very few free electrons at night), from summer to winter, and as a function of the solar cycle (fewer during solar minimum). For treatments of this correction, see Chelton et al. , Imel , and Callahan . Because this effect is dispersive, measurement of the range at two frequencies allows it to be estimated. 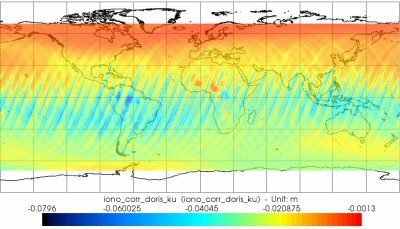 Under typical ocean conditions of 2-metre significant wave height, the Ku band ionospheric range correction that is determined from the dual frequency measurements from the altimeter is expected to have an accuracy of ±0.5 cm. Chelton et al., Satellite Altimetry, Satellite altimetry and Earth sciences, L.L. Fu and A. Cazenave Ed., Academic Press, 2001. Imel, D., Evaluation of the Topex/Poseidon dual-frequency ionosphere correction, J. Geosphys. Res., 99, 24, 895-906, 1994. Callahan, P.S., Ionospheric variations affecting altimeter measurements: A brief synopsis, Mar.Geod., 8, 249-263, 1984.